In and out. In and out. Your cat repeatedly visiting the litter tray is not something any owner wants to see, because it’s a sign of bladder discomfort. There are many causes of urinary problems, but surprisingly stress can be a trigger factor in around 50-70 % of cases. Unfortunately, to get a diagnosis of stress-related cystitis requires a battery of tests to rule out physical issues such as urine infections or bladder stones, which could have serious consequences if undetected. That said veterinarians increasingly recognize the role mood plays in creating inflammation and therefore pain in the urinary tract. Knowing the important part stress plays in bladder disease, let’s look at practical way you can help your cat at home, and improve their urinary tract health. Cats are solitary hunters. This means they like to keep themselves to themselves, and sharing resources such as food and litter trays can be stressful for a feline. In practical terms, correcting this means providing each cat with their own food and water bowl, litter tray, hiding spot, and safe entrance and exit to their territory so they can come and go without anxiety. Cats communicate by scent. Some odors, such as facial pheromones, act as a strong signal that a place is safe and secure. Adding synthetic feline pheromone to a home sends a strong message that this is a place of safety. Feliway products by CEVA are designed for home use, and the range includes a diffuser module, a spray mister, and a hand rub. Sticking with the theme of stress relief, the latest buzz is tryptophan dietary supplements. This essential amino acid is actually a precursor of the feel-good hormone serotonin. In turn this hormone plays an important part in mood control, and contributes to feelings of contentment and well-being. A study where some cats were given tryptophan food supplements and other were given a placebo, the group receiving tryptophan demonstrated a measurable decrease in stress-linked behavior such as urinating where they shouldn’t. Shifting our focus to the urinary tract, we know dilute urine is less irritant to the lining of the bladder. Therefore, encouraging the cat to take more fluid on board is a good thing. You can do this by providing water bowls with a large surface area (rumor has it cats like seeing their reflection as they drink) in several locations in the house. Pet drinking fountains are also great, and remember wet food has a higher moisture content than dry, which leads to more dilute urine. Keep your cat lean. Overweight cats are lazier than lean ones, and tend to get up less often to urinate. This means the irritants in urine sit in the bladder for longer, giving them more opportunity to cause inflammation. Restrict the amount of food the cat eats, but also consider a change of diet. Your veterinarian can recommend a prescription diet balanced to be low in minerals that can cause crystals and irritate the lining. There are substances which attach to the bladder lining and make it harder to toxins to attach and attack the delicate surface. Think of this like greasing a baking tray to stop the cake mix from sticking. These substances have the impressive name of glycosaminoglycans, thankfully abbreviated to GAG! GAG supplements are another nutraceutical (a food supplement with a pharmaceutical like benefit) and available from your veterinarian. Indeed, if your cat is not good at taking capsules (few are!) it also comes in an injectable form. 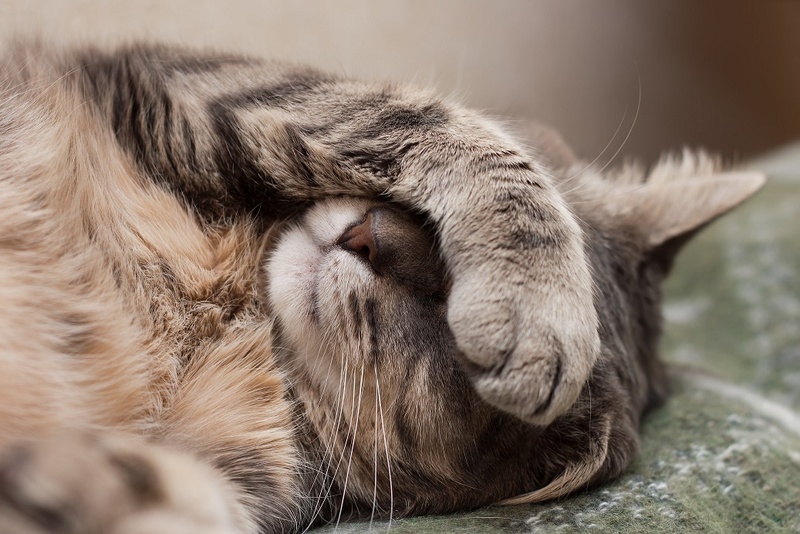 Unless your cat has had a thorough check by the vet and has been diagnosed with stress-related cystitis, never assume this is the cause of your cat’s urinary discomfort. Some problems, such as a blockage in the urethra may superficially look like stress-related disease but is in fact life-threatening, so always seek your veterinarian’s help.